To find out, you could thread through a fairly lengthy and dense academic definition. Or, if you live in the San Francisco Bay Area, you could just visit the newly occupied Gill Tract. Because yesterday, on Earth Day, dozens activists took over a piece of land controlled by the University of California at Berkeley, and dedicated it to food sovereignty. Right now, they’re planting 15,000 seedlings. The wires are already buzzing with news about the occupation. I’m drawn to it for a number of reasons. First, it’s terrific agricultural land, of which there is a dearth in the East Bay, and activists are busy using it to grow food. Second, the protest is very pointedly a protest about the privatization of the university. The organizers are frustrated not only with the dwindling size of agricultural land, but also at a broken model of public education that requires the university to asset strip itself by selling off its best land, and then to pimp itself out to the private sector to fund public education. Tucked in there is an idea of freedom and choice that’s central to food sovereignty. The food system is filled with choices made by a handful of powerful people, in smoke filled rooms, over the objections of the majority. What the occupation is doing is making these decisions public. I asked who’d be receiving the food grown on the occupied land. One organizer, who didn’t want to be identified because her job was with the university, said that who gets the food should be a community decision, answered with words that might be the bumper sticker for food sovereignty: “We thought it was wisest to leave that open”. The University has shut off the water supply. The occupiers are asking for your support: please call the University Chancellor on 510 642 7464 to ask that the water be turned back on. 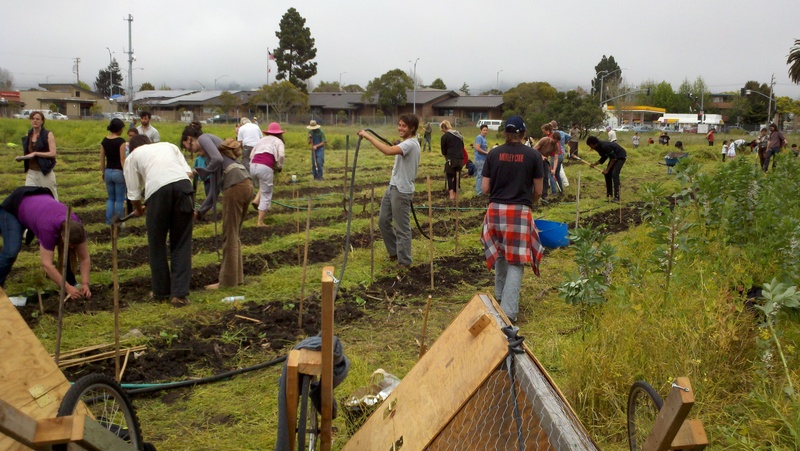 (Albany, Calif.), April 22, 2012 – Occupy the Farm, a coalition of local residents, farmers, students, researchers, and activists, are planting over 15,000 seedlings at the Gill Tract, the last remaining 10 acres of Class I agricultural soil in the urbanized East Bay area. The Gill Tract is public land administered by the University of California, which plans to sell it to private developers. For decades, the UC has thwarted attempts by community members to transform the site for urban sustainable agriculture and hands-on education. With deliberate disregard for public interest, University administrators plan to pave over this prime agricultural soil for commercial retail space, a Whole Foods, and a parking lot. How sad! After reading an article about homeless children in the Poconos,PA,where I reside, I got angry knowing we have the capacity to help as nation, not only here in the Poconos, but in all of the U.S, but all over the world. BUT!! Greed from CEOs and stupidity from our government, we allow this to happen. It is sad, we have the so-called richest nation in the world, yet we can’t feed our children. But who is to blame? The greed from corporation as they are willing to sacrifice morals, as they have no feeling when they let employess go, for the sake of the bottom line. Perfect example of corporate greed and CEO is Wal-Mart. At the same time we allow the left liberal elite to dictate un-common sense policies that would rather take care of Non-Americans first rather than our own. Mr. Patel, I recommend that you and other readers read the several articles and commentary about the Gill Tract Occupation in the excellent coverage on Albany’s local on-line newspaper, Albany Patch. See what the university researchers have to say about the research the occupiers have disrupted. And please do follow up by reading the information posted on the City of Albany website about planning for the Gill Tract. Get the full picture and multiple points of view before making up your mind about the Gill Tract Occupation. For example, the research that has been disrupted by the Occupy the Farm activists is not an example of the university “pimping” for the private sector. It is basic research into how plants grow, funded by the National Science Foundation and the U.S. Dept. of Energy (which is very interested in biofuels as a possible sustainable energy source for the future). It is not research for Monsanto. It is not research involving genetically modified foods for agribusiness. Corn is used as a research medium because it has properties that make it convenient for researchers to use. The University did not allow public access to the Gill Tract because the research taking place there requires great care, for example in identifying exactly which plant is which. The portion of the Gill Tract the occupiers are occupying is not slated for private development. Current plans call for Little League fields, park space, and yes, an urban garden, if and when the University decides at some point to stop using it for research. The process used by the Occupy the Farm group has not been an open, democratic process. Instead, according to their own account, they planned this occupation in secret for 6 months before they broke the lock on the Gill Tract gate and entered the property. In doing so, they bypassed the vibrant local democratic process in our well-run little city, which already has a number of initiatives under way to encourage urban gardening and a greener lifestyle, and to lower our carbon emissions. The Gill Tract is not the only place in our local area where urban gardening can take place. A City-developed plan proposes using the corridor under the elevated BART tracks, which spans the entire city, for orchards. A Patch reader suggested that the same stretch of land could be used for urban farming. Our City actively encourages home vegetable gardening, for example by giving compost away. Under a program sponsored by Transition Albany, I share my veggie garden with an apartment dweller, who contributes labor in exchange for her own garden plot in part of my back yard. Who gets the food? is a great question, and I’m not surprised that the Gill Tract occupiers had no answer. They haven’t thought responsibly about what it would really take to maintain a thriving urban farm. Who pays the water bill? Who allocates garden plots and makes sure the garden is kept up? Who distributes the food, and how? If this is a new job for city government, fine, but that needs to be worked out with our city and local community. Or, the activists could form a non-profit organization and develop an ongoing infrastructure to raise funds, purchase land,and run an urban farm. It’s worth giving some thought to the noble history of civil disobedience, and whether it is truly being emulated by the Occupy the Farm action. To me, civil disobedience is justified when grave injustice is occurring and the democratic processes that allow us all to live together are utterly failing to address it. To me, the activists occupying the Gill Tract have failed to make that case. And, failing to make that case, they are not walking in the footsteps of Thoreau, Gandhi, Rosa Parks and Martin Luther King. No, they’re just people who decided they knew better than the rest of us, and they were just going to take over land belonging to someone else and do as they see fit. That makes them ordinary criminal trespassers. One last thought: To me, there’s a strong case for civil disobedience as a response to the massive corruption on Wall Street and the corruption of our democracy by private wealthy interests. Here, our democratic system has so far fallen far short of taking action that in any way measures up to a real threat to our democracy. So, I support Occupy Wall Street. As I said above, I don’t think the occupation of the Gill Tract rises to the same level at all. In fact, to me, it cheapens the concept of civil disobedience. My last thought, I promise. Albany, CA is not a food desert. It is a food oasis. From my house, I can walk to 2 year-round farmer’s markets, one entirely organic. In summer, I can walk to a third farmer’s market, entirely organic, run by the City of Albany in cooperation with a non-profit organization. We have fabulous fresh produce, including organic, in multiple nearby grocery stores, several of them locally owned. We are a middle-class community; many of the people who show up as poor in census data are university students, not the typical profile of urban poverty. Our neighboring community to the immediate south is Berkeley, home of more farmer’s markets and spectacular produce markets offering a mind-boggling array of fresh organic produce year-round. So, if my local public university is going to commit resources to supporting urban farming as one of its community services, I would argue strongly that the university ought to be doing that in the Bay Area’s many high-poverty communities–our real food deserts where extra help for urban farming is desperately needed. Ellen, thank you so much for making these points. I would have done the same, but chasing down all of the bad media coverage is exhausting, and I do have work to do. Actually, the work I’m not doing involves basic research in plant biology, which is being blocked by this particular action. I’m one of the researchers whose work is so casually dismissed by well meaning but poorly informed media outlets like this one. It would be so refreshing is someone like Raj Patel (or perhaps one of his assistants) took the time to actually read up on the particulars in this case before enthusiastically supporting it. It makes me think that one of the defining features of ideological thinking is being willing to ignore inconvenient truths in favor of sweeping ideas. Just once, I’d like to see someone, anyone, in the liberal blogosphere say, “Yes, but…” when referring to this particular action.